LalBrew® Nottingham is an English style ale yeast selected for its high performance and versatility for a wide variety of styles and fermentation conditions. Traditional styles brewed with this yeast include but are not limited to Pale Ales, Ambers, Porters, Stouts and Barleywines. In addition to these traditional styles, Nottingham can be used to produce Golden Ale, Kölsch, Lager-style beers, IPA, and Imperial Stout, among many others. 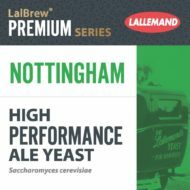 LalBrew® Nottingham is a relatively neutral ale strain that is stress tolerant making it a good choice for high gravity, sour and other challenging fermentation conditions.